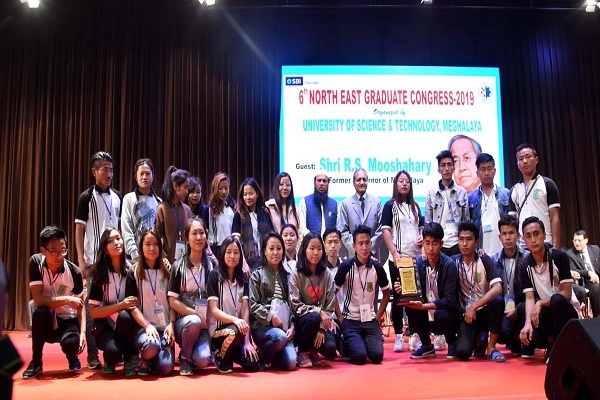 9th Mile, Ri-Bhoi, 17 February, 2018: The three-day-long 6th edition of North East Graduate Congress (NEGC) has come to an end today at the University of Science & Technology Meghalaya (USTM) with participation of more than 10,000 students from the entire north-eastern states. 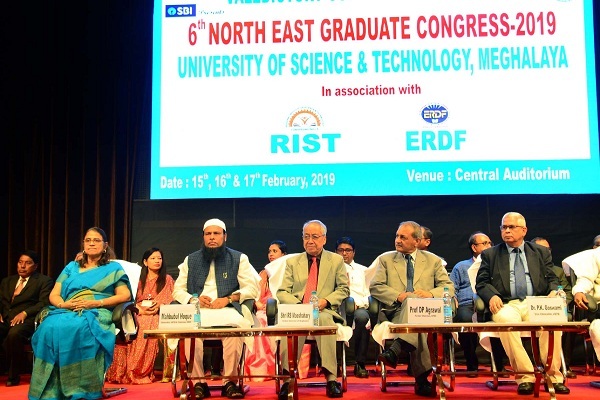 The valedictory function in the morning was graced by Shri RS Mooshahary, Former Governor, Meghalaya and Prof. DP Agarwal, Former Chairman, UPSC, New Delhi, apart from thousands of youths representing colleges from various parts of the region along with the principals or teachers accompanying them. Prizes and awards worth Rs 10,00,000 (Ten Lakh)in different disciplines were conferred to the winners. 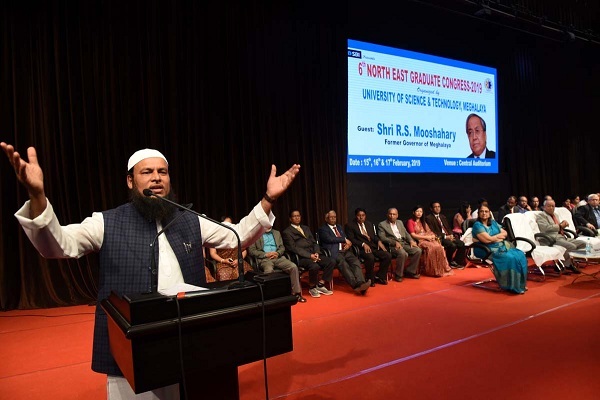 Offering the valedictory speech, Mahbubul Hoque, Chancellor of USTM thanked all the participants of NEGC 2019 and encouraged for more and more participation of students in this flagship event of the university. He said, “If any student is brilliant and unable to go for higher education, they should get recommendation from their college Principal. Our doors are always open for free education of meritorious students”. He emphasised on entrepreneurship and said that there has to be innovative approach in any entrepreneurial venture. He stressed on saving the environment and presented saplings to all the participating colleges, along with the prizes and awards. Some of the prizes given in NEGC 2019 were, four scooters to the Best Debater (Chandan Bora, Dhing College), the Best Graduate (Ashish Saikia, Nagaon College),Best Cricketer (Salman Khursid, Karimganj College) and the Best Footballer (Swmkhwr Doimary); three Best Colleges were Thoubal College, Manipur (first), Captain Williamson Memorial Govt. College, South Garo Hills (second), and JN Aier College, Dimapur while 10 other colleges were awarded consolation prizes of certificates, mementoes, plants and cash awards. Other prizes include, Best Team of Cultural Procession (1st-Sonapur College, Assam, 2nd-Thoubal College, Manipur and 3rd-Dhokuakhana College, Assam), Most Active College (Nagaon College) and Most Disciplined College (Loyola College, William Nagar). Best team for quiz went to Cotton University. Earlier on Saturday, the event was launched by Prof. D P Agarwal, Former UPSC Chairman; as well as young political icons Hardik Patel (social activist), MsRuchi Gupta, AICC JtSecy and in charge of NSUI; Jignesh Mevani, MLA from Gujarat . Prafulla Kumar Mahanta, former Chief Minister, Assam; Rohit Chahal, National Media In Charge, BJP (Youth Wing) and Allantry Dkhar, Vice President of UDP, Meghalaya also participated in the event. Thousands of students from nearing 300 colleges from all over the north-eastern states participated in this mega youth conglomeration. On Feb 17th morning, thousands of students witnessed the gala beginning of 6th NEGC with the cultural manifestations of eight sister states of the region. Each state of the North East was represented by the students of 60 communities belonging to the entire region, each state displaying indigenous cultural presentation with indigenous costumes. Separate sessions were held simultaneously at different venues at USTM. Session on ‘Decision Making Process: Role of Youth in Context with NE Region” was taken by Prof. D P Agarwal, session on personality development by renowned motivational speaker Thomas John Rose, soft skill workshop, technical session on competitive exams by Sailen Baishya A National Workshop for Teachers was also held.